[A]ny time I write that I’m going to do/say/explain something “tomorrow” or “soon” or “shortly” or any other chronologically-oriented word that would indicate a time horizon in the relatively near future, add at least a week or two to it. I hopped over to read through the article… and came away a smidge disappointed. Sure the information was perfectly valid (at least in my limited experience), and the folks interviewed are well-known as “experts” in the “how do I start a solo practice” arena. I see their names everywhere and have no reason to doubt the wisdom of what they’ve written. But, like I’ve mentioned before in this old entry on when to attend law school, lawyers just love giving über-balanced, taking-into-account-every-conceivable-variable, “it depends” answers to even the most-straightforward of questions. I mean no disrespect when I say this, but it’s not like this is an audition for hiring a starting-a-law-firm consultant; we’re not expecting what worked for any-given-expert to work for us, or for any-given-expert’s finances to look just like ours. We are looking for snippets of info to give us a mental ballpark to play in — something to set the outer bounds on our internal debate, so we can then drill down into our own particular circumstances and make a well-reasoned decision. If you’re anything like me — setting up a “traditional” brick-and-mortar law firm in an urban area in the Southeast — my guess is you’ll be looking at somewhere around $15Kish in non-payroll expenses for Year 1, with ~$750 of that coming out-of-pocket in the beginning. 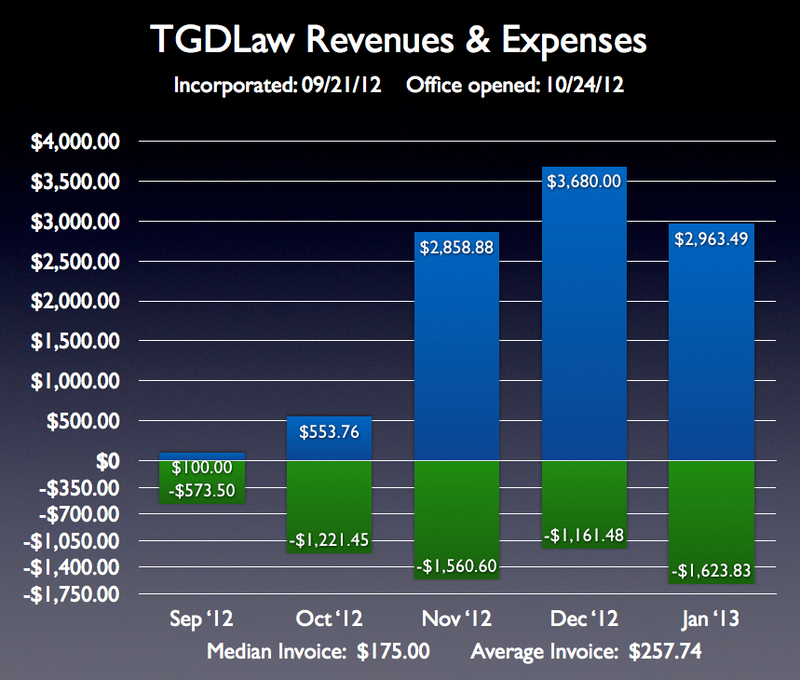 The graph I put together on the right is the running tally I’ve been keeping for my own law firm, from the day I set up my LLC back in September 2012 through the end of last month. 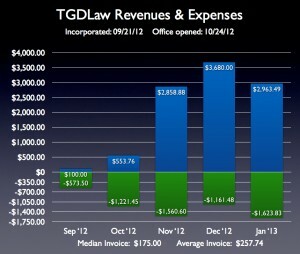 At the moment I’m averaging around $1,400/mo in cash flowing out of the business (though with several of those chunks coming from items unique to my practice). Everything else is widely variable: office supplies got stockpiled early but have been tapering off, billable client costs swing based on who comes through the door, and all the CLEs I’ve paid for thus far aren’t even required until February 2014. 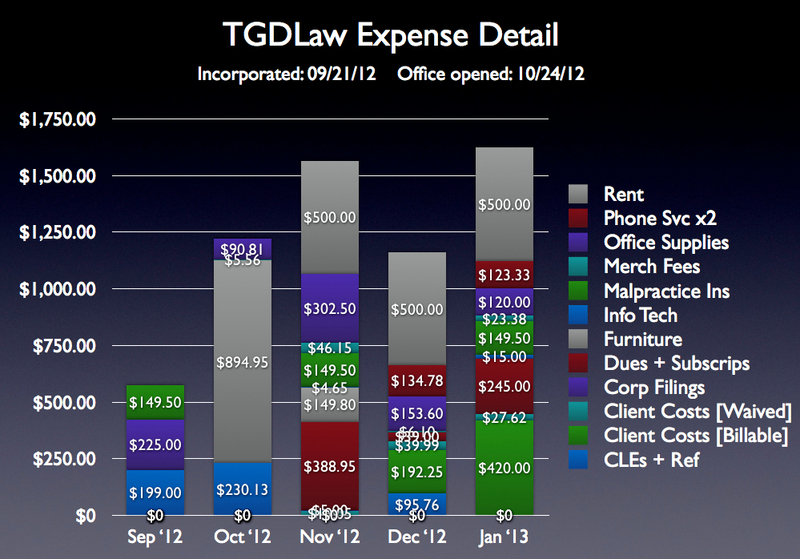 One thing I thankfully don’t have are IT-related expenses, something you can take care of before graduating law school. I tried breaking the expense data down into categories — the graph is a bit of a mess, but some of the data is still viewable enough to be useful. Now how much of this will you likely be parting with up-front? If you start your firm as a PLLC,2 you’re looking at $225 in filing costs just to get the business entity established: a $50 PLLC fee to the State Bar, $125 to file your Articles of Organization with the Secretary of State, and $50 to the Department of Revenue for your privilege “license” / tax. Malpractice insurance costs will vary based on where you focus your practice, but the $600 ballpark seems pretty common based on the handful of first-year solos who’ve shared their info with me. The upside is that most malpractice providers have some kind of installment plan so you’re not shelling out the full balance on Day 1. Add in another $250ish for the first 3 things you’ll want starting out, and you’re out-of-pocket no more than $750ish before you’re able to start generating revenue and getting things off the ground. That “getting things off the ground” part is the biggest challenge you’ll have starting out, since that’s how you’re going to generate whatever volume of profit you need to keep food on the table at home. I’ve tried my best to make up for both problems with a higher volume of clients, but just take my word for it: the advice you read about requiring cash up front is legit, and you’ll have a much easier time paying your bills if you don’t deviate from it! 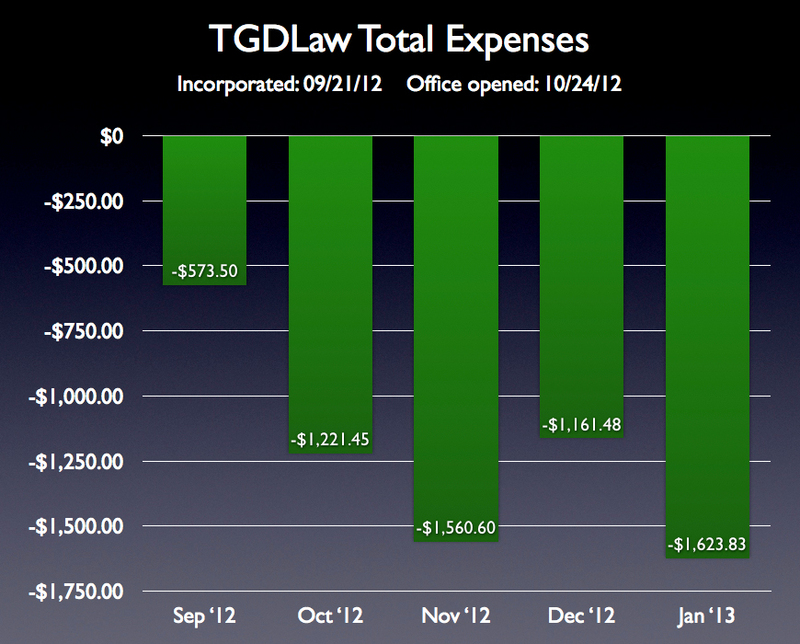 Once the revenue starts coming in, it’s then on you to have the discipline to not spend it. 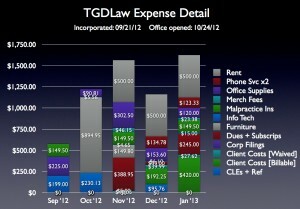 One way to help with that is to scale back your personal expenses where possible. I got rid of my cable TV service back before the bar exam, and haven’t gone back. I upped the deductibles on my health insurance since I’m fairly healthy and keep an unused credit card to cover the deductible in case of a medical emergency. I also consolidated my student loans and submitted my app for the Income-Based Repayment plan before I even started my firm. With no income at the time, I’ve got $0 in loan payments for the first year. 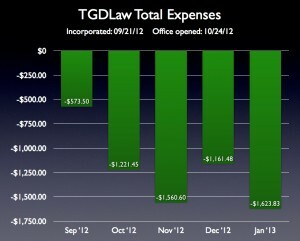 It hurts to look at the accruing interest each month, but it buys some time to get the law firm reliably afloat. So there you go I’m not an expert of course (meaning take all of this with the usual caveats) but hopefully this data provides some insight to those of y’all thinking about starting your own law firm. It’s something I highly recommend, so if you’ve got any business-related questions I can answer let me know!